Marketing Communications Specialists take charge of business marketing and advertising strategies, the job role of a marketing communications specialist typically consist of conducting research, analyzing customer needs, maximizing sales turnover, enhancing ROI, securing resources, generating and implementing campaigns, communicating with project development heads to promote the brand and conducting trade show exhibitions. They are also involved in conducting marketing research and monitoring the campaigns. 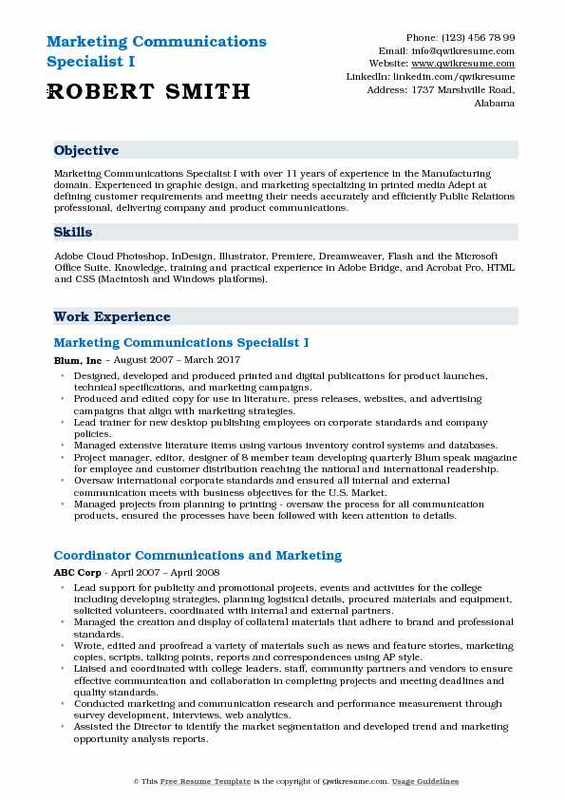 For becoming a marketing communications specialist one needs to demonstrate in the resume some abilities such as – marketing expertise, presentation skills, time management skill, teamwork, computer competencies, excellent verbal and written communication skill and multitasking ability. 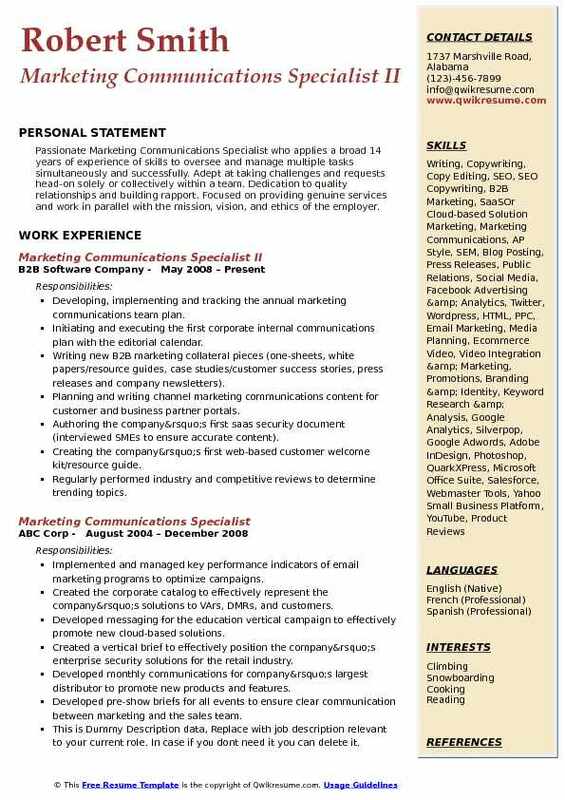 Hiring employers look for Marketing Communications Specialist Resume sample that displays a Degree in Advertising, public relations, marketing or its related field. 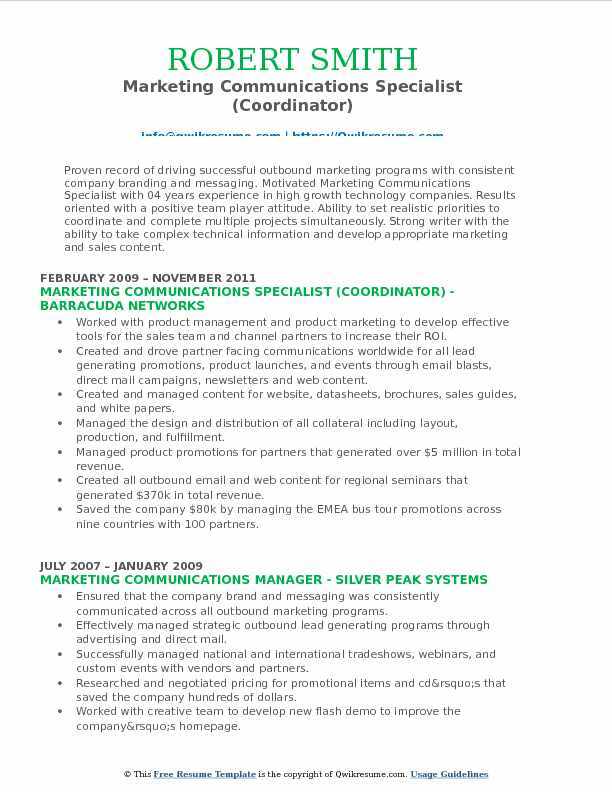 Summary : Senior Marketing Communications Specialist with 10 years of experience. Extensive administrative history coupled with recent sales and marketing experience. Enthusiastic and innovative problem-solver with proven ability to consistently improve methods and generate creative solutions. Team oriented agility to respond to current trends and best practices. Skills : New Product Development, New Product Launch, Product Management, Cross-Functional Team Building, Research Methods, Product Life Cycle Management, Voice Of Customer/Partner, Branding & Positioning, Competitive Market Analysis, Customer Relations, Six Sigma & Lean Manufacturing, Direct Response & Sales Material, Event And Trade Show Planning, Demand/Lead Generation, Safety Communications, Promotion Management, Social Media Campaigns. Recruited to the Honeywell marketing communications team in August 2015. Responsible for working collectively with cross-functional departments on all internal and external communications. Responsible for managing the Salisbury brand strategy by working with channel marketing to drive new initiatives, programs and demand generation campaign opportunities. Serving as liaison with product managers in the launch of new products, promotions, and creation of materials that promote and support growth of new marketing qualified leads. Supporting the graphic design initiatives which include: collaborate with a group of creative individuals to produce a finished product. Contributing as required to the design of marketing materials, including print collateral and package design. Performing quality assurance procedures and review content for providing full writing support for safety communications, technical documents, brochures. Partnering with public relations by participating in the creation of press releases, social media posts. Maintaining up-to-date electrical safety images and collateral in multiple digital and print libraries. Summary : Detail-oriented Marketing Communications Specialist with 10 plus years of experience in the Finance domain with a commitment to ensure an organization's bottom line success. High-energy, resourceful leader recognized for proactive initiative, flexibility, and continuously meeting deadlines. Managing the development of all leadership presentations, bulletins, handbooks, and brochures. Creating and launching the corporate magazine “VCI Insider” and dealer newsletters. Manager of analysts and interns for dealer and corporate communications deployment (5 years). Developing the eInvoice messaging for brand updates, lease pull-ahead, and new model launches. Revamping financial services website for VW, Audi, and Ducati to include online account access. Ensuring all dealer and consumer campaigns and collateral are consistent with brand initiatives. Executing internal survey campaigns and employee data analysis for leadership. Coordinating the dealer and customer data arrangements for marketing campaigns. Analyzing and compiling the customer invoice data for targeted sales campaigns. Customizing all corporate announcements to dealers from leadership and sales operations. Developing the dealer onboarding materials for educating new F&I managers with F&I procedures. Managing the field salesforce database for dealer CRM communications and loyalty programs. Summary : Marketing Communications Specialist with 10 years of experience in the Manufacturing domain is seeking to acquire a challenging position in an environment where I can utilize my design, writing and project management skills to do what I do best: Develop and implement successful creative campaigns, marketing programs, and collateral materials that positively impact brand recognition. In charge of both Karcher floor care and Windsor Karcher group brands. Optimizing and monitoring the marketing efforts including the number of leads, web traffic, and promo success. Planning our yearly advertising and promotions including print, online and social media advertising. Creating and maintaining the corporate identity standards. Developing templates for all North American marketing employees to use. Developing materials for events including annual trade show. Works booth at National Trade Show. Maintaining and optimizing our customer rewards program. Keeping the plan within budget. Overseeing and evaluating the market research and adjusting our branding to stay ahead of the competition. Monitoring the competitive brands marketing and adjusting ours to stay ahead of the curve. Writing all marketing copy for floor care including translating German-English into meaningful messaging for our local market. Reporting to the upper management on status and results of marketing campaigns voice of the customer to the web team, product management, and marketing department. Creating launch packets for new products - including product sheets, end-user guides, email blasts, pricing inserts, press releases and bid specs. 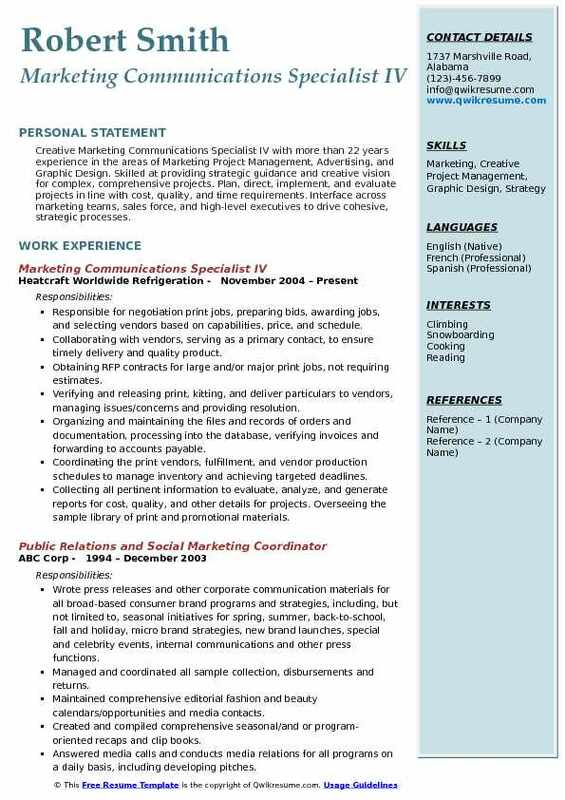 Summary : Marketing Communications Specialist with 8 years of experience in the Non-Profit domain. An extensive background in air quality work, with a diverse background of experience, has prepared me for the duties and responsibilities that this position entails. Dedicated to supporting and promotion of green trucking technologies and strategies. Prepared and edited materials for program flyers, brochures, guides, and web content. Shared technical announcements and regulatory information with stakeholders and clients. Planned and coordinated the activities/events requiring media notifications and community promotions. Researched and supported for managing grant programs and defining compliance guidelines. Identified and evaluated the emerging technologies offering innovative fuel efficiency products. Prepared marketing materials, publicized events for the roll-out of electrical infrastructure at truck stops. Uses salesforce and constant contact to provide news, tracked customers, collected data. Designed, produced and maintained company marketing campaigns and collateral materials. Found potential clients lists and sources to procure and updated these lists working independently and with outside consultants. Summary : Creative Marketing Communications Specialist IV with more than 22 years experience in the areas of Marketing Project Management, Advertising, and Graphic Design. Skilled at providing strategic guidance and creative vision for complex, comprehensive projects. Plan, direct, implement, and evaluate projects in line with cost, quality, and time requirements. Interface across marketing teams, sales force, and high-level executives to drive cohesive, strategic processes. Responsible for negotiation print jobs, preparing bids, awarding jobs, and selecting vendors based on capabilities, price, and schedule. Collaborating with vendors, serving as a primary contact, to ensure timely delivery and quality product. Obtaining RFP contracts for large and/or major print jobs, not requiring estimates. Verifying and releasing print, kitting, and deliver particulars to vendors, managing issues/concerns and providing resolution. Organizing and maintaining the files and records of orders and documentation, processing into the database, verifying invoices and forwarding to accounts payable. Coordinating the print vendors, fulfillment, and vendor production schedules to manage inventory and achieving targeted deadlines. Collecting all pertinent information to evaluate, analyze, and generate reports for cost, quality, and other details for projects. Overseeing the sample library of print and promotional materials. Effectively communicating with the sales team, project managers, and other stakeholders on modifications that potentially affect budgets and/or target dates. Creatively developing new design concepts, graphics, and layouts, preparing rough drafts and presenting ideas. Modifying/improving final designs based on feedback and comments, presenting for full approval and preparing finished design file for print. 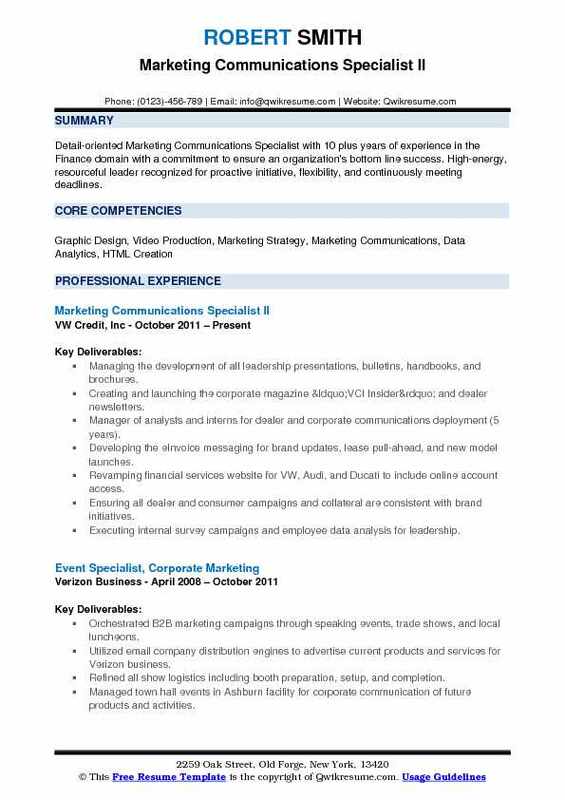 Summary : Marketing Communications Specialist I with over 11 years of experience in the Manufacturing domain. 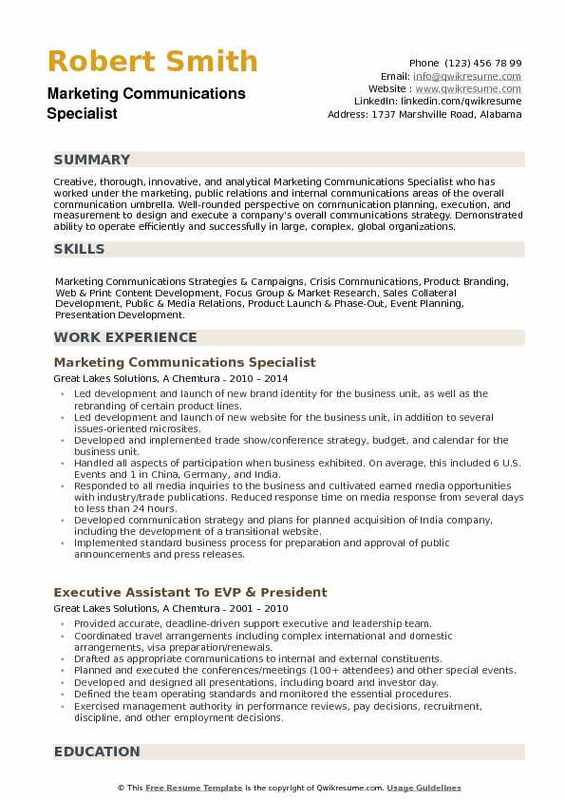 Experienced in graphic design, and marketing specializing in printed media Adept at defining customer requirements and meeting their needs accurately and efficiently Public Relations professional, delivering company and product communications. 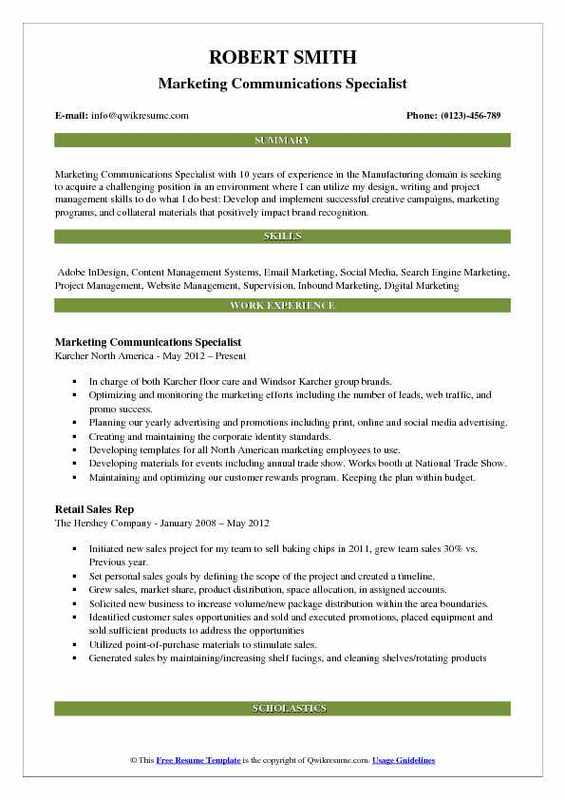 Skills : Adobe Cloud Photoshop, InDesign, Illustrator, Premiere, Dreamweaver, Flash and the Microsoft Office Suite. Knowledge, training and practical experience in Adobe Bridge, and Acrobat Pro, HTML and CSS (Macintosh and Windows platforms). Designed, developed and produced printed and digital publications for product launches, technical specifications, and marketing campaigns. Produced and edited copy for use in literature, press releases, websites, and advertising campaigns that align with marketing strategies. Lead trainer for new desktop publishing employees on corporate standards and company policies. Managed extensive literature items using various inventory control systems and databases. Project manager, editor, designer of 8 member team developing quarterly Blum speak magazine for employee and customer distribution reaching the national and international readership. Oversaw international corporate standards and ensured all internal and external communication meets with business objectives for the U.S. Market. Managed projects from planning to printing - oversaw the process for all communication products, ensured the processes have been followed with keen attention to details. Developed and designed communication material and videos that enhanced the sales representatives and customers understanding of complex product features and aid in selling more effectively. Planned, coordinated, and developed the product photography for use in brochures, web, and advertising. Objective : Proven record of driving successful outbound marketing programs with consistent company branding and messaging. 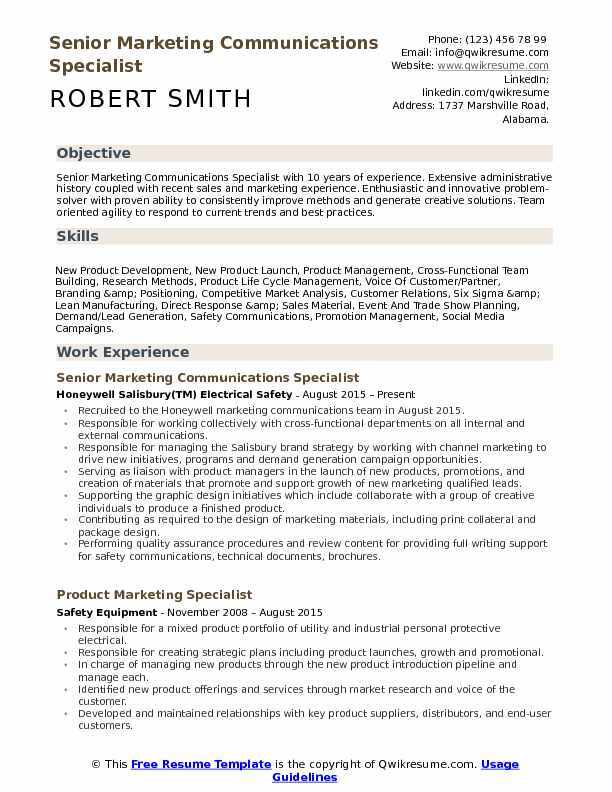 Motivated Marketing Communications Specialist with 04 years experience in high growth technology companies. Results oriented with a positive team player attitude. Ability to set realistic priorities to coordinate and complete multiple projects simultaneously. Strong writer with the ability to take complex technical information and develop appropriate marketing and sales content. Worked with product management and product marketing to develop effective tools for the sales team and channel partners to increase their ROI. Created and drove partner facing communications worldwide for all lead generating promotions, product launches, and events through email blasts, direct mail campaigns, newsletters and web content. Created and managed content for website, datasheets, brochures, sales guides, and white papers. Managed the design and distribution of all collateral including layout, production, and fulfillment. Managed product promotions for partners that generated over $5 million in total revenue. Created all outbound email and web content for regional seminars that generated $370k in total revenue. Saved the company $80k by managing the EMEA bus tour promotions across nine countries with 100 partners. Created a USB sales kit for partners to effectively share collateral, demos, videos, and presentations. Maintained the partner portal to ensure all sales enablement tools are available to resellers and distributors. Managed Google Adwords campaigns for weekly product seminars and webinars to improve SEO. 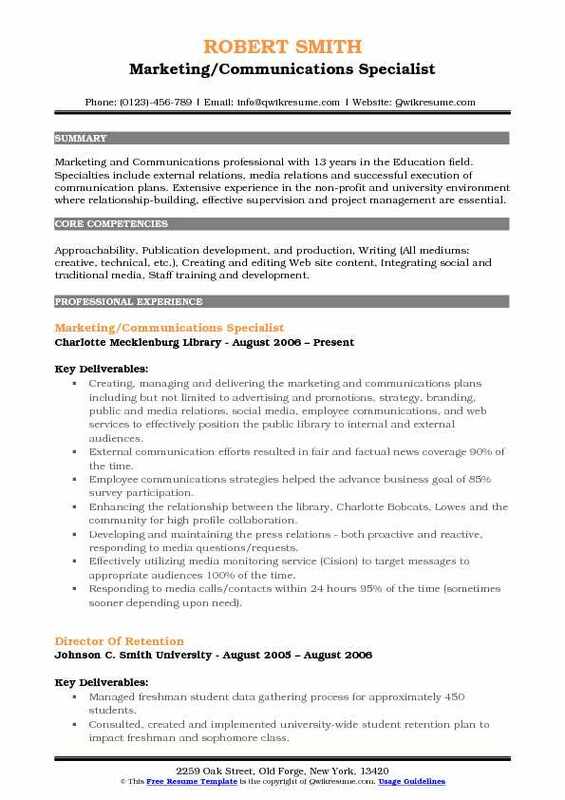 Summary : Marketing and Communications professional with 13 years in the Education field. Specialties include external relations, media relations and successful execution of communication plans. Extensive experience in the non-profit and university environment where relationship-building, effective supervision and project management are essential. Skills : Approachability, Publication development, and production, Writing (All mediums: creative, technical, etc. ), Creating and editing Web site content, Integrating social and traditional media, Staff training and development. Creating, managing and delivering the marketing and communications plans including but not limited to advertising and promotions, strategy, branding, public and media relations, social media, employee communications, and web services to effectively position the public library to internal and external audiences. External communication efforts resulted in fair and factual news coverage 90% of the time. Employee communications strategies helped the advance business goal of 85% survey participation. Enhancing the relationship between the library, Charlotte Bobcats, Lowes and the community for high profile collaboration. Developing and maintaining the press relations - both proactive and reactive, responding to media questions/requests. Effectively utilizing media monitoring service (Cision) to target messages to appropriate audiences 100% of the time. Responding to media calls/contacts within 24 hours 95% of the time (sometimes sooner depending upon need). Identifying potential stories/pitches, writing and disseminating the press releases, Q&A's and briefing documents. Summary : Passionate Marketing Communications Specialist who applies a broad 14 years of experience of skills to oversee and manage multiple tasks simultaneously and successfully. Adept at taking challenges and requests head-on solely or collectively within a team. Dedication to quality relationships and building rapport. Focused on providing genuine services and work in parallel with the mission, vision, and ethics of the employer. Developing, implementing and tracking the annual marketing communications team plan. Initiating and executing the first corporate internal communications plan with the editorial calendar. Writing new B2B marketing collateral pieces (one-sheets, white papers/resource guides, case studies/customer success stories, press releases and company newsletters). Planning and writing channel marketing communications content for customer and business partner portals. Authoring the company’s first saas security document (interviewed SMEs to ensure accurate content). Creating the company’s first web-based customer welcome kit/resource guide. Regularly performed industry and competitive reviews to determine trending topics. Updated web copy with highly-effective SEO keywords and phrases, resulting in first page Google SERP rankings. Developed and monitored the progress of email marketing campaigns, resulting in industry standard open rates of 15-20% and 8% CTR. Summary : Creative, thorough, innovative, and analytical Marketing Communications Specialist who has worked under the marketing, public relations and internal communications areas of the overall communication umbrella. Well-rounded perspective on communication planning, execution, and measurement to design and execute a company's overall communications strategy. Demonstrated ability to operate efficiently and successfully in large, complex, global organizations. 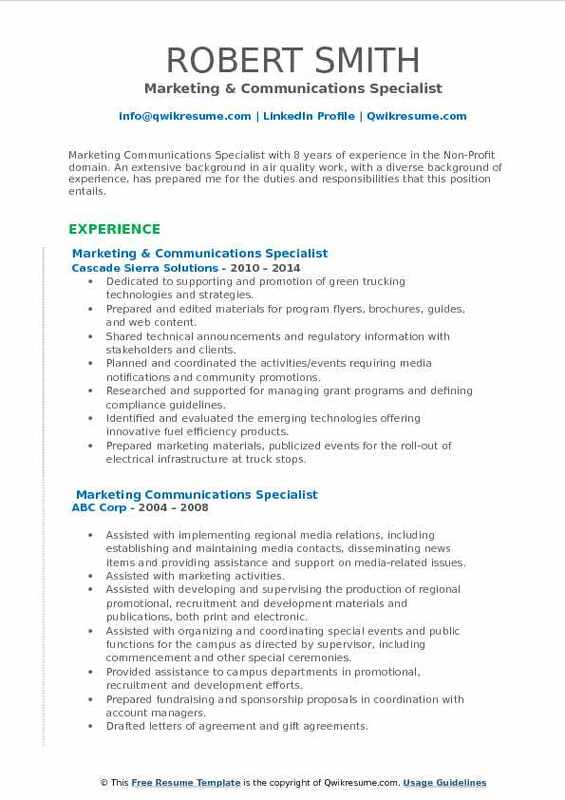 Skills : Marketing Communications Strategies & Campaigns, Crisis Communications, Product Branding, Web & Print Content Development, Focus Group & Market Research, Sales Collateral Development, Public & Media Relations, Product Launch & Phase-Out, Event Planning, Presentation Development. Led development and launch of new brand identity for the business unit, as well as the rebranding of certain product lines. Led development and launch of new website for the business unit, in addition to several issues-oriented microsites. Developed and implemented trade show/conference strategy, budget, and calendar for the business unit. Handled all aspects of participation when business exhibited. On average, this included 6 U.S. Events and 1 in China, Germany, and India. Responded to all media inquiries to the business and cultivated earned media opportunities with industry/trade publications. Reduced response time on media response from several days to less than 24 hours. Developed communication strategy and plans for planned acquisition of India company, including the development of a transitional website. Implemented standard business process for preparation and approval of public announcements and press releases. Standardized a communication plan template to ensure all personnel was properly informed and prepared for the communication. Partnered with corporate communications and investor relations functions on press releases, investor presentations, annual reports and media inquiries. Drove development of sales toolkits and managed relationships with graphic designers, translation firms, and internal stakeholders to develop and produce all the business units collateral.